Were you looking for Waypoint, a UNSC news source, or Navigation point, also called "waypoint"? Halo Waypoint is the official online portal for all Halo-related content. It showcases Halo news, updates, lore, stats, and other related Halo materials. Halo Waypoint provides users with various kinds of Halo information, including information on members of the Halo community, various machinima videos and gameplay strategies and tutorials. It also allows players to access their own gameplay-related data, total Halo Gamerscore through multiple games in the series. Most major announcements regarding the Halo series are also posted at Waypoint. Waypoint is accessible online at halowaypoint.com as the primary Halo website. The Xbox 360 version of Halo Waypoint was co-developed by Certain Affinity and 343 Industries. It was released by 343 Industries as part of the Xbox Fall Update on November 5, 2009. 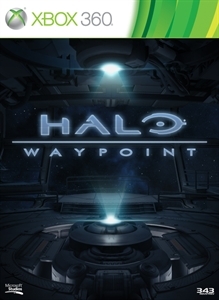 In May 2012 Halo Waypoint was updated to include Kinect compatibility. The Xbox 360 version was last updated with the release of Halo: The Master Chief Collection; the application is still accessible, though the information is no longer current. A mobile version of Halo Waypoint was released for the Windows Phone 7 (and later 8), iOS, and Android platforms for free, though it lacked a number of features found on the web and Xbox versions. An additional feature called ATLAS was released in December 2011 which showed detailed diagrams of Halo: Reach multiplayer maps and near real time game player and weapon location stats in Matchmaking and Custom Games. ATLAS was free on the Windows Phone 7 and available for $4.99 on iOS and Android. 343 Industries discontinued support for the Waypoint mobile apps on August 1, 2014. The Halo Channel is a next-generation iteration of the Waypoint concept and is available on the Xbox One and Windows 8.1. The Halo Waypoint website received a visual and organizational overhaul on October 14, 2014 in preparation for the release of the Halo Channel and Halo: The Master Chief Collection. On July 23, 2009 Halo Waypoint was announced as an Xbox 360 application that would feature several Halo Legends videos. The Halo Waypoint website launched September 2009. The site provided basic information on the Halo franchise detailing the games, and also supplied weekly updates involving the Halo Community, but it lacked the stat tracking and achievement records the subsequently released console app featured. Following this, many marketing sites for Halo, including the Halo Wars Launch Site. On October 19, 2009 the Xbox 360 Halo Waypoint was first shown in a preview video, and on October 30 it was available to Xbox Preview members. On November 5, 2009 the Halo Waypoint app on Xbox 360 was publicly released. On August 4, 2010 a Beta forum was added to the website which allowed communication between Halo fans on the site. That same day, many marketing sites for previously released Halo media, such as the Halo Wars Launch Site, were removed and redirected to the Halo Waypoint site instead. On December 15, 2010, the Halowars.com forums went offline and were subsequently merged with the Halo Waypoint forums. On September 14, 2010 the website was redesigned. This redesign removed the timeline feature and previously found on the site, and a footer at the bottom of the page that changed every time the page refreshed. On February 26, 2011 a Beta stat tracker was added for Halo: Reach on the forums. On September 8, 2011 a Gamma forum was created for the testing features that was going to be used in the final build of the forums. This subsequently lead to the Beta forum ending and leading to the final build of the forum to be completed. On March 31, 2012 Halo Waypoint officially took over all record-keeping responsibilities from Bungie.net. On October 13, 2014, the web version of Waypoint received a massive overhaul, which included the removal of some of the elements found on the site since its launch. The Xbox 360 version did not receive such an update, and as such these features can still be found there. Content on Halo Waypoint is divided into seven main categories: Games, News, Esports, Community, Forums, Universe, Shop/Store. There is also a profile section that houses several content such as Channel. Players can find information for each and every Halo game, organized by title. The web version displays only limited galleries as well as links to service records and related forums. The Xbox 360 version features extensive galleries, as well as access to trailers and videos. News gives users info on the current Halo news, such as the Halo Community Update, info on the newest game released, and so on. Esports gives users info on Halo Esports news that is happening. The main page displays recent articles and blog posts, as well as Waypoint's Twitter and YouTube feeds. Additional links provide easy access to the newsfeed, eSports information, the Halo Community Feedback Program, Spartan Companies, and Waypoint forums. An easy menu directs players to the Waypoint forums where they can discuss Halo media and content with other players. The forums feature several ranks, and badges based on stuff the users do. This section includes Universe articles from after 2014. Any articles written before 2014 can only be viewed on Halo Waypoint on Xbox 360. The web version is updated, current, and continually expanding. Categories are Characters, Species, Factions, Weapons, Vehicles, Tech, Locations, and ONI Files (Conversations From the Universe, Cold Storage Reports, Eleventh Hour reports, Halo 3 Terminals, OPERATION: Red Flag/ 93893, PoA Tech Communications, Reach Data Drops). Information is presented in text articles with accompanying images. The Shop features physical items for sale including clothing, action figures, books and more, and also includes links for the purchase of digital and physical products including games and soundtracks. In the web version, a player's profile allows them to write a brief bio, view their basic Halo stats, recent forum activity, and Waypoint badges. A drop-down menu provides links to the service record for each game from Halo 2 Vista through Halo 5: Guardians. The Halo Wars, Halo: Reach and Halo 4 service records also feature links to the more extensive stats pages found on Waypoint and HaloWars.com prior to the October 2014 overhaul. Career Milestones have been replaced by a simple total of the gamerscore unlocked across all Halo Games with achievements, save for Halo 2 Vista. The player's comprehensive Halo 5: Guardians includes detailed Arena, Warzone and campaign stats, game history, commendations, medals, Requisitions and achievements. The player's Spartan Strike service record includes basic statistics, mission progress and high scores, and achievements unlocked. The player's Spartan Assault service record includes basic statistics, mission progress and high scores, and achievements unlocked. The MCC service record denotes campaign progress, terminals unlocked, K/D ratio, achievements, campaign high scores and best times. The Halo 4 service record displays the basic information of the player's Halo 4 career including: Completed Specializations, Player Since, Last Played, Total Playtime, Spartan Points, Challenges Completed, Campaign Completion, Spartan Ops Completion, total Commendation progress, number of achievements unlocked, the four Top Medals earned, games played by mode (campaign, Spartan Ops, War Games, and Custom War Games), most used weapon, and most played variant. Complete Halo 4 statistics can be found in the Halo 4 Stats web app. Players can view detailed information regarding their play in campaign, custom and matchmaking War Games, and Spartan Ops. This includes statistics, game history and progress towards current Challenges, as well as specific Achievements and Specializations progress. Players can also view Domain Terminal and Spartan Ops videos. Players can view all of the same information for everyone on their Friends list, or simply compare their friend's basic stats to their own. In the Xbox 360 version, this feature is known as "Barracks". The Halo: Reach service record outlines a player's Service Record, Stats (including weapons stats), Game History, and Challenges. The PC version of Waypoint also allows players to view Medals and Commendations, File Share, File Sets, Recent Screenshots, Xbox Downloads and Tag History. Bungie.net medals do not appear on Halo Waypoint. [note 1] Previously, players could view and compare their detailed Reach stats with their friends' in the web version. This has been discontinued, however on the Xbox 360 version under Halo: Reach Service Record players can compare their basic Reach stats using "Friend Compare" and their general career stats using "Player Card Compare". The service record features an image of the player's in-game Spartan armor. On August 1, 2014, this image ceased to be updated. The Anniversary service record which outlines basic campaign progress on each level and difficulty. The record displays achievement progress, and denotes as the number of Terminals unlocked, Skulls collected, and objects scanned in the library Library. The terminal videos can only be viewed on the Xbox 360 version, which can be viewed by pressing "X" while in the main menu or by manually accessing the "Classified" menu. The PC version of Waypoint also includes basic statistics pages for Halo 2 Vista, Halo 3, Halo Wars, and Halo 3: ODST. Statistics displayed are: games played, kills, kill-death ratio, and achievements unlocked. Most of the following features were once found on the web version of Waypoint, but can now only be viewed on the Xbox 360 version. Found in the main menu is a list of Universe entries on places, people, vehicles, and so on. These specific entries are not the same as the ones on the website. Found in the main menu, "Forward Unto Dawn" is available to players who have either paid for access to Halo 4: Forward Unto Dawn or purchased the Halo 4 Limited Edition. Players can view exclusive photo galleries and watch the complete film, bonus videos, and character interviews. Previously known as the Halo 4 Interactive Guide on the Website. Players can obtain detailed information about Halo 4 in this guide. Information is organized in the following subheadings: Basics, Story, Enemies, War Games, Weapons, Vehicles, and Armor. The player's Waypoint Career records a player's progress through the entire Halo series. The Waypoint Career displays Career Milestones, Awards, and basic individual stats summaries for all eight games, including Halo 2 Vista. Milestones are achieved as a player's Halo gamerscore increases. Only Xbox 360, Windows 8, and Windows Phone 8 achievements contribute to career milestones. Halo 2 Vista and Xbox One achievements are not supported. The original cap of forty milestones at launch has been increased incrementally with the release of additional games and achievements. The number was raised to its current and final level, 100, on July 15, 2013. Halo Awards are medals that a player can earn by unlocking related achievements in the Halo games; essentially, they are groupings of achievements. As an example, the Vehicle Specialist award is unlocked after completing several vehicle-related achievements. Awards are also given in tiers; the more achievements a player unlocks, the higher the tier of their award will become. (For example, completing "extra" vehicle-related achievements will increase the Vehicle Specialist award's tier.) Tiers are indicated by the number of lines at the top of the awards, just beneath the ribbon. Locked awards appear silver; once a player has reached a high enough tier, the awards become gold. Only achievements on the Xbox 360 are listed on Waypoint, and as such Halo 2 Vista and Xbox One achievements are not included. Halo 4 achievements and Halo: Spartan Assault were only added to the Joint Service, Elite award. Halo 3 A.C.E. • Halo Wars A.C.E. • Halo 3: ODST A.C.E. • Halo: Reach A.C.E. • Halo: Anniversary A.C.E. The Xbox 360 version of Waypoint allows players to view every Halo achievement from every Halo game released on the Xbox 360, as well as the Windows 8 and Windows Phone 8 versions of Halo: Spartan Assault. The achievements can be viewed from their own record in the Waypoint Career menu. Halo 2 Vista and Xbox One achievements are not included. The web version of Waypoint allows players to view these same achievements, which are instead displayed in their respective service records. Terminals and other unlockables are recorded under Classified. There are five separate Data Sets: Alpha Halo Archive, Requiem Archive I, Requiem Archive II, Section 3 Archive, and Draetheus V Archive. These were found though numerous ways, most notably through the Section 3 ARG. Several avatar awards) can be unlocked through the Xbox 360 version of Waypoint. To unlock an Award, the player must complete a specific task in one of the Halo games and then open Halo Waypoint on their Xbox 360 while signed in on their Xbox Live profile. There are currently 10 avatar items which vary from a Monitor prop to armor variants such as ODST helmets. Halo Waypoint Monitor: Log In to Halo Waypoint for the first time. An Avatar 'prop' which adds an idle animation to the player's Avatar in which their character summons a Forerunner Monitor who bobs and hovers around them playfully. Rookie Helmet: Unlocked Halo 3: ODST's Campaign Complete Achievement (Any difficulty). A 'hat' for Avatars, made in the image of the helmet worn by the Rookie. ODST Armor: Unlock Halo 3: ODST's Good Samaritan Achievement. A costume for Avatars which dresses them up in a recreation of the combat armor worn by Orbital Drop Shock Troopers in Halo 3: ODST. Black ODST Shirt: Unlock Halo 3: ODST's Tourist Achievement. ODST Hoodie: Unlock Halo 3: ODST's Dark Times Achievement. Recon Helmet/Dare's Helmet: Unlock Halo 3: ODST's Vidmaster: Endure Achievement. Unlocks a 'hat' for Avatars, made in the image of the famous Recon helmet. Referred to as "Dare's helmet" when worn by female Avatars and as "Recon" for male Avatars. EVA Helmet: Achieve Milestone level 50 in Halo Waypoint. Comes in red or blue color schemes. Halo: Reach Beta Hoodie: Participated in the Halo: Reach Multiplayer Beta. A green hooded sweatshirt for Avatars with "Reach Beta Tester" written on the front and the Noble Team emblem on one shoulder. Halo 4 - RAIDER Helmet: Unlock all technical specs for the RAIDER Spartan-IV armor variant. Halo 4 - Raider DSTT Helmet: Unlock all technical specs for the Raider DSTT Spartan-IV armor variant. Military Police (Base): Reach Waypoint Career Milestone 15 and unlock The Soldier We Needed You To Be achievement from Halo: Reach. Military Police (CBRN/HU/RS): Reach Waypoint Career Milestone 20, unlock the Pink and Deadly achievement from Halo 3: ODST and the Military Police (Base) Helmet. Military Police (HU/RS/CNM): Reach Waypoint Career Milestone 25, unlock the Fear the Pink Mist achievement from Halo 3, the A Spoonful of Blamite achievement from Halo: Reach and the Military Police (CBRN/HU/RS) Helmet. CQB (Base): Reach Waypoint Career Milestone 20 and unlock the Folks Need Heroes... achievement from Halo: Reach. CQB (HU/RS/CNM): Reach Waypoint Career Milestone 25, unlock the Campaign Complete: Heroic achievement from Halo 3: ODST and the CQB (Base) Helmet. CQB (UA/HUL): Reach Waypoint Career Milestone 30, unlock the Campaign Complete: Legendary achievement from Halo 3, the Gods Must Be Strong achievement from Halo: Reach and the CQB (HU/RS/CNM) Helmet. UA/Base Security [W]: Reach Waypoint Career Milestone 30 and unlock the Yes, Sensei achievement from Halo: Reach. In the Halo universe, Waypoint is a major news source and interstellar mail delivery system. This is most likely a reference to Halo Waypoint being the official source of news on the Halo universe. On Xbox 360, Waypoint is considered a game as this was the only option available when it was released (downloadable apps were not introduced until more than 2 years later). The "game" bears an ESRB rating of M for "Blood and Gore", "Language" and "Violence". Halo Waypoint's first cover, 2009-2010. Halo Waypoint's second cover, 2010-2011. Halo Waypoint's third cover, 2011-2012. Halo Waypoint's original official banner, 2009-2010. Halo Waypoint's official banner, 2010-2012. Waypoint's first title screen 2009-2010. Halo Waypoint mobile app icon for Android and iOS. Halo Waypoint mobile app for Windows Mobile. Halo Waypoint's old Blog Background's info. Old version of the site. One of the Milestones a user could unlock. Classified section "Section 3 Archive" image. Classified section "Requiem Archive" image. Classified section "Requiem Archive 2" image.